Saved the “worst” for the last. 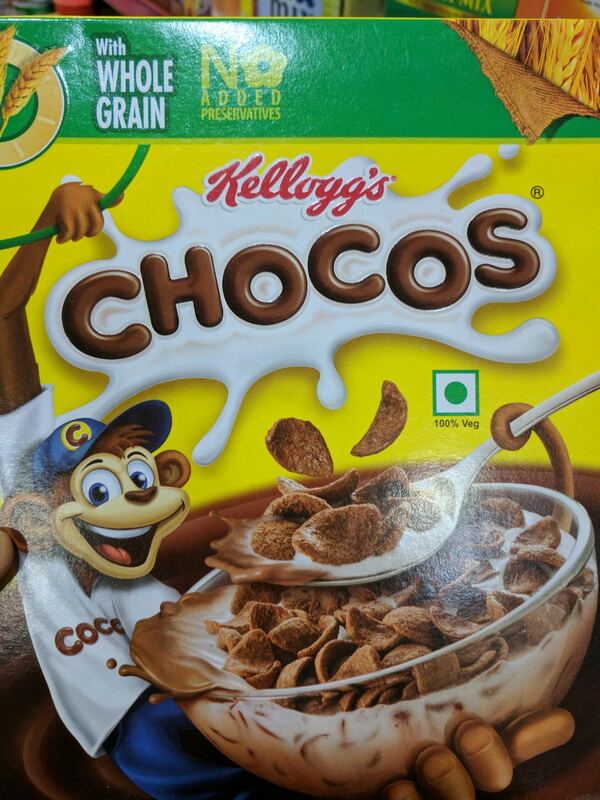 In my not-so-humble opinion, Kelloggs Chocos is the WORST junk food of all. You want to know why? Ask any urban school going kid what he/she had for breakfast. Most likely, you’ll hear “I ate chocos”. Once, I got a reply that stunned me - "I ate moon&stars”. It took me a while to figure out that it is one of the variants of Chocos. I had earlier written about the rise of ready-to-eat breakfast cereals in India, more on the lines of how they are being marketed/promoted. In this post, let’s look at the ingredients of regular Kelloggs Chocos and nutritive facts breakdown. Before we do that, if you have Chocos at home and a weighing scale, please measure the usual quantity you’d normally give your child. Does it come to 30 gm or more than that? Please, please do share the quantity in the comments below. The recommended serving size is 30 grams and the nutrition profile is given for the same. But I have a suspicion that 30 gms is too small a serving size and our kids are eating more than that. I truly hope that my suspicion is wrong. See, this is the perfect example of a product that has both whole wheat flour and maida in equal proportions. Though the package claims “with whole grain”, it is not fully whole grain. For a serving size of 30 gm, it contains 10.4 gm of sugar, which is a little more than 2.5 tsp of sugar. Starting the day with a sugar rush, aren’t we? I sincerely pray that additional sugar is not added on top of it while serving with milk. I know many kids want to add sugar to the regular corn flakes and milk. Though the fat content is relatively low compared to other junk foods, we need to be aware of the source of the oil. Palmolein is the cheapest edible oil available on the planet. It has caused severe environmental degradation, rapid deforestation and habitat loss, especially for orangutans. The Human Food Project claims that palm oil causes low-grade inflammation, that is linked to insulin resistance and obesity. According to this source, oxidized palm oil induces reproductive toxicity and organotoxicity particularly of the kidneys, lungs, liver and heart. If the brand claims that Chocos is high in calcium and iron, where do you think such minerals come from? Not from wheat flour, sugar or oil. Synthetic minerals are added separately, in order to make the brand promise more health-focused. It’s a different question whether such minerals are actually absorbed by our body and if yes, upto what extent. When you see sodium as 0.1 gm, it looks so minuscule, isn’t it? But sodium requirement is measured in mg/day. The adequate intake (AI) of sodium for kids in the age bracket of 4-8 years is 300 - 600 mg/day. So with a chocos breakfast, the kid has already exhausted nearly 1/3rd of sodium requirement in a day. What’s the need for salt in a sugar-laden breakfast cereal? One reason that I presume is that salt increases addictive property. Another reason could be to enhance the taste. If you had observed how our grandmothers made payasam/kheer, they would usually add a tiny pinch of salt along with jaggery. The reason being salt brings out the sweet flavour more prominently. Commonly called caramel colour, this specific colour INS 150d is called Sulfite ammonia caramel. It is also used in carbonated drinks like Coke. In 2011, the European Food Safety Authority (EFSA) has reviewed the safety of a group of caramel colours (150a, 150b, 150c and 150d). The Panel points out that adults and children who are high consumers of foods containing these colours could exceed the ADIs established for three of these colours (E150a, E150c, E150d) if they are used at the maximum levels reported by industry. The maximum permissible intake is up to 200 mg/kg body weight for E150c and E150d. Side effects are manifested from the use of IN150c and IN150d, where intestinal problems may occur after ingestion of large amounts. The manufacturing process of caramel results in the production of 4-methylimidazole (4-MeI), which is carcinogenic. Food manufacturers hide under the argument that the quantity consumed has to be extremely high in order to face the side-effects of this chemical. Similar to the point on minerals. Synthetic vitamins are added, so the brand can claim that the pack is high in B vitamins. Again, to what extent such vitamins are absorbed by the body is something to think about. 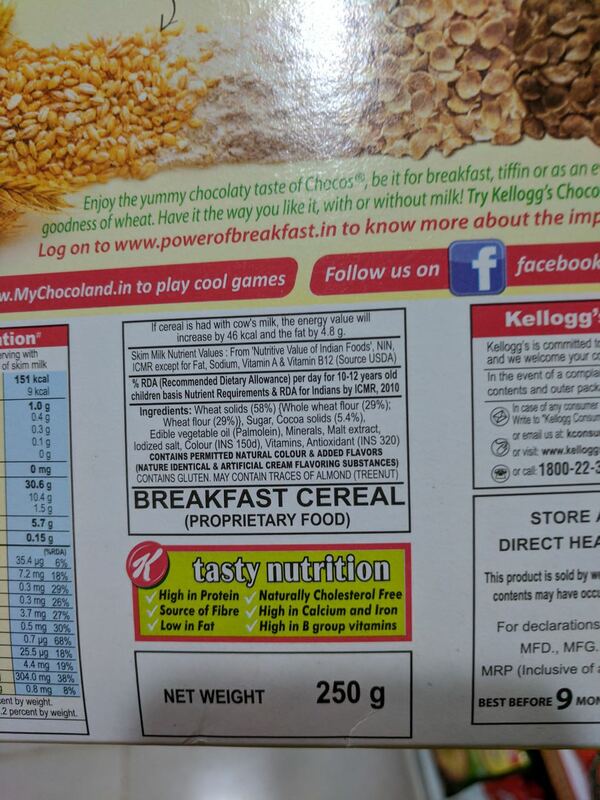 This is present in almost all breakfast cereals of Kelloggs, including Special-K which many from the elite class perceive to be good for weight loss. It is also present in Soulfull brand of breakfast cereals, which tags along the goodness of “ragi”. Looking at its ingredients, it is as unhealthy as Kelloggs, with the use of hydrogenated vegetable fat, stabiliser, emulsifiers etc. Let’s be conscious that adding good ingredients like ragi doesn’t increase the nutritive quotient in such packaged foods. Processing, preservation and packaging DOES REQUIRE the use of various food additives. One can’t escape from this simple fact. 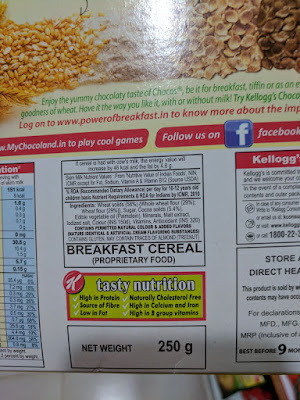 If a kid is eating Chocos every single day for breakfast, it means that he/she is also ingesting harmful chemicals like INS 320 and INS 150d on a daily basis. Not to forget the sugar and palmolein. As I was reading these side-effects, it felt so disturbing to me. What did our kids do wrong? Why did we introduce such harmful foods in the first place? If we reason ourselves saying “My kid eats only Chocos for breakfast and nothing else”, the kid is not at fault here. Rather, it is us as parents who introduced such junk to them and who ought to take the responsibility. My intention is not to judge or make anyone feel guilty. I have bought such packaged foods for my daughter too. Though she doesn’t eat them on a daily basis, she has tasted them. Please let’s get back to making fresh home-made breakfast every single day from now on. Let’s take complete responsibility for our kids’ health and not rely on these profit-focused food corporations. Indian cuisine is so vast and varied, with so many different recipes. Why opt for such homogenous, ready-to-eat junk that are totally unhealthy, ridiculously expensive and causes various environmental issues? I had shared a few breakfast ideas in this post. I've also been sharing my daily menus on Instagram. I’ll be more than happy to share recipes/tips/meal planning/hacks etc. I started this exercise when I noticed popular food bloggers promoting packaged foods big time. It made me feel angry to see such irresponsible posts. As I started diving into the ingredients, food additives etc, it felt like I’m going into a rabbit hole. I took a few popular junk food brands and planned a 2-posts-per-week project. 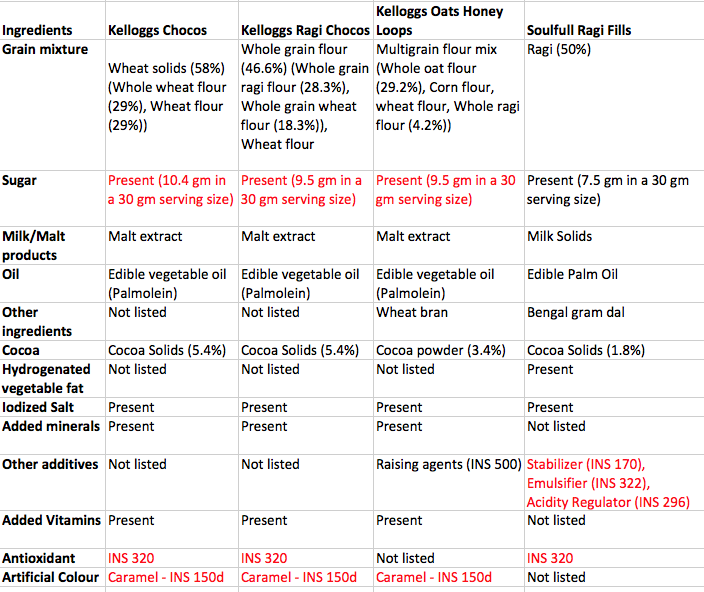 After 4 weeks(and 8 posts), I have only covered a handful of the popular, packaged foods. Reading about the additives and their side-effects is disturbing and alarming. This is the concluding post and I thank everyone who supported me with their kind words of encouragement. If you want me to write about any other packaged food in similar manner, please do let me know. I have only scratched the surface through this analysis. There are plenty of artificial additives and chemicals that all of us are consuming unknowingly. Let’s be aware of them. The next time you go shopping, please make sure to read the ingredients list. Do a quick google search if you come across any jargon. Think twice before adding a packaged food to your shopping cart. The same applies when you shop online too.